So what’s everyone making for their Memorial Day barbecues? We are splitting up this weekend to travel to various sporting events and tournaments and I’m guessing that my culinary highlight will be the egg and cheese sandwich at whatever Starbucks is closest to the track or field. (Reminder that I am not complaining. I love those sandwiches and would, in fact, starve if it meant watching my girls play sports all day.) 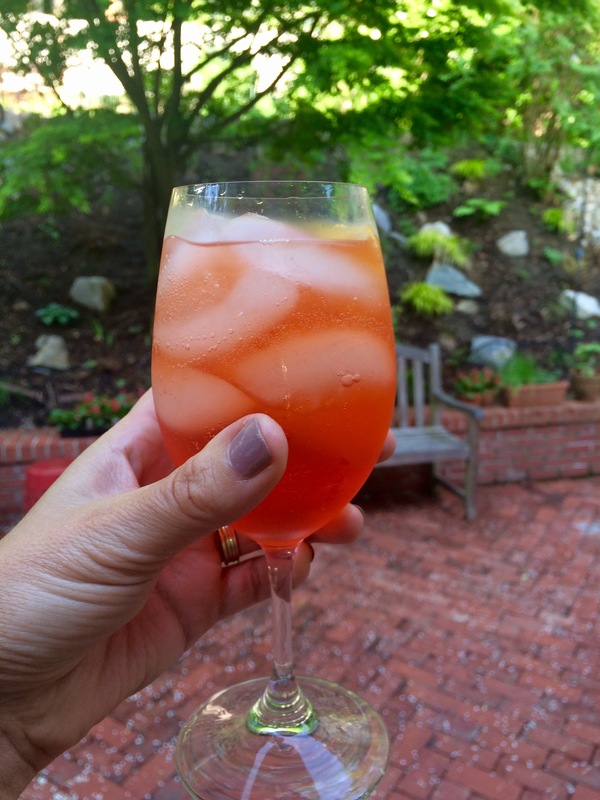 But if we were normal people with normal Memorial Day plans and about to email our barbecue hosts with questions like What Can I Bring?…here is what I’d probably say: I’ll bring everything we need to make Aperol Spritzes, which might just officially be my second most favorite drink of summer. (Here’s my first, of course.) It’s refreshing, simple to assemble and one glass of it will make you and your host feel like you’ve started off the summer exactly right. 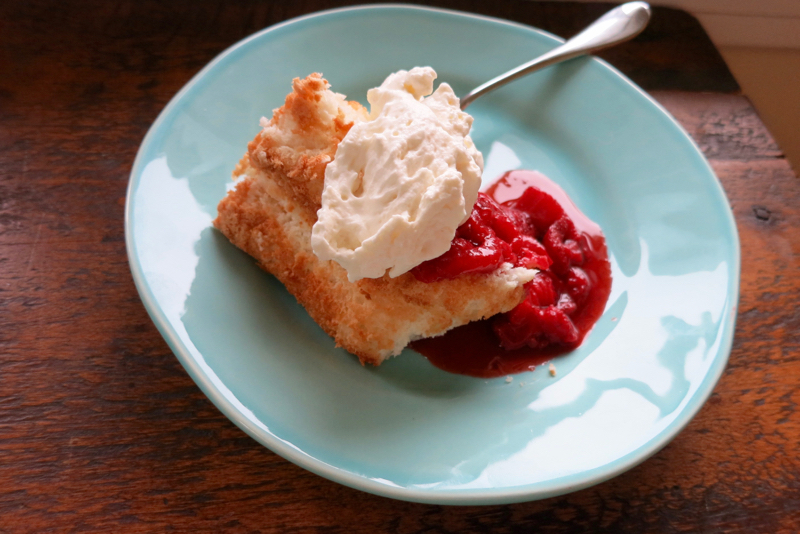 Or, I’d offer up this Angel Food Cake with strawberry sauce and fresh whipped cream. Last weekend, in the supermarket I spied the shrink-wrapped store-bought kind that my mom used to bring home to applause from her three young kids, and I promptly returned home to bake one. The only thing that beats that memory? A sauce drizzled on top of it made with fresh spring strawberries. Do whatever you have to do to track some down. Here’s the recipe I love. (And the post Andy wrote about it remains one of my all-time favorites. )You can save the egg yolks for Chocolate Mousse if you’re feeling resourceful and ambitious. This is literally on the back of the Aperol bottle, so you won’t have to come back here for instructions. Fill a wine glass with ice cubes, then add 3 parts Prosecco to 2 parts Aperol, a splash of soda, and an orange slice. If you are having people over, you can make a pitcher ahead of time. I never really pay too much attention when I make this — it’s one of those feel your way, non-recipe recipes. But basically, you want to find the freshest strawberries possible, remove their stems, then halve or quarter about a cup and half of them. Add to a saucepan with about 2 tablespoons of sugar, the juice of a half lemon, and a little water. Turn heat to low and cook until the berries break down and you have a syrupy sauce. In a medium mixing bowl, preferably chilled, whisk together 8 ounces heavy cream, 1 teaspoon powdered sugar, and 1/4 teaspoon pure vanilla extract until stiff peaks form. Makes enough to dollop on top of 8-10 slices of cake. Related: Bon Appetit‘s always ahead-of-the-curve what-to-grill slideshow. in Venice, where you can drink spritzes all day (low-alcohol means rehydrating! ), they put a green olive on the skewer with the slice of orange. delicious! I love an Aperol spritzer! Thanks for the reminder! We are headed to my sister in-law’s in Virginia. Planning to bring the cinnamon nut loaf coffee cake from your HTCE cookbook. But a bottle of Aperol with a bottle (or 2) of Prosecco sounds like a fine accompaniment (i nix the soda…doesn’t seem neccessary). Cheers! So beautiful and so mouth watering dish. Hi Jenny, without sounding stalker-ish I am a huge fan. Loved your first cookbook and still refer to it, and the last one has many bent pages. Plus I regularly pull up from the blog a family fave–chicken parm meatballs. Sooo good! What is your prosecco of choice? I haven’t had any that stick in my mind…dying to try your Aperol spritzer. Thanks!